Since its founding in 1994, JBO has performed many of the major works of such well-known composers as Bach, Handel, Telemann, Vivaldi, Scarlatti, Purcell, and Lully. We have also explored the lesser known masters of the eighteenth century: Graupner, Heinichen, Zachow, Pergolesi, and many others. We did not neglect the early seventeenth-century masters such as Cima, Castello, Frescobaldi, and Monteverdi. Extending our scope in the other direction, we have performed early works of Josef Haydn and W. A. Mozart. 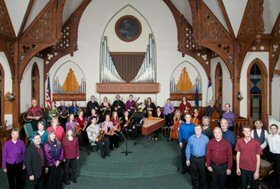 Enhance your musical productions with the assistance of the Jefferson Baroque Orchestra.